Every day, thousands of men and women put their lives on the line serving in the military for America’s freedom. On Memorial Day, we remember those whose lives were lost and remind ourselves that for many returning home, a new battle begins. To help those who have sustained paralyzing injuries while on active duty and after, Paralyzed Veterans of America (Paralyzed Veterans) and Pennzoil® have teamed up to retrofit cars to give mobility back to paralyzed veterans. The video reveals the story of Hank Ebert, who received a retrofitted Toyota Sienna van, featuring the latest technology for paralyzed drivers, as part of Pennzoil’s "Love Your Car" program in partnership with Paralyzed Veterans. A U.S. Navy veteran, Ebert served four years in the Navy as a crewman on a rescue helicopter in Vietnam. Today, despite his paralyzing injury, he stays active and participates in the Veteran’s Wheelchair games, is a fishing guide and an avid drag racing fan. He was nominated by his local Minnesota Paralyzed Veterans chapter to receive the retrofitted vehicle and was overwhelmed by the generosity. "I’m incredibly excited. It hasn’t even sunk in yet how excited I am," said U.S. Navy veteran, Hank Ebert. "From winning this car, to being flown to Charlotte to see my first NASCAR race, to being here with all my friends to celebrate, it’s just awesome." With more than 44,000 American veterans living with paralysis and rising healthcare costs, veterans are in greater need of support. Paralyzed Veterans’ Mission: ABLE campaign aims to help the nation’s paralyzed veterans rebuild their lives. With support from companies like Pennzoil, Mission: ABLE can continue to provide disabled veterans with tools to help them regain their mobility. 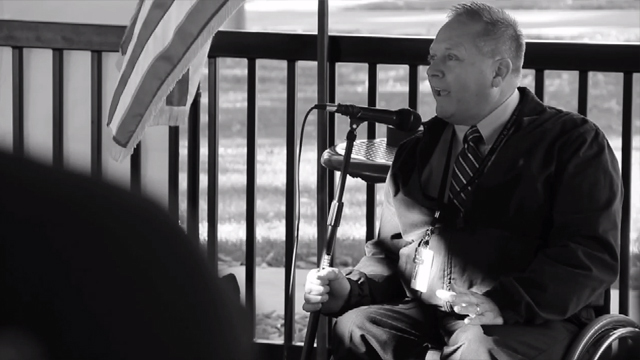 Think you have story that's better than Paralyzed Veterans of America's?